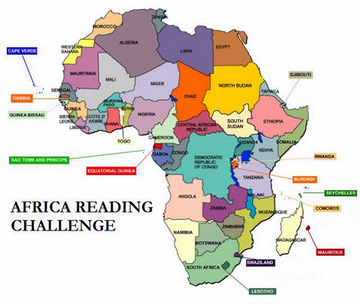 Thanks for participating in the Africa Reading Challenge. Please use the Mr Linky below to share your review. Reviews will be posted on this page and updated every month. If you don’t have a blog, then please leave an update on your progress in the comments section. I’ve been reading like crazy! Some of my recent Africa-related posts: Mighty Be Our Powers (non-fiction; Liberia), Benny and Omar (adolescent lit- fiction, Tunisia), The Worst Date Ever (non-fiction, Uganda), The Unknown Soldier (graphic novel, Uganda), Slave (non-fiction; Sudan), and History of Love (fiction, Sierra Leone). Trying to read a book from every country in the world, so loving some of the posts on obscure English texts! There’s also a link to my shelfari page on this site which holds more comprehensive reviews. I just finished reading and reviewing Graceland by Chris Abani. It’s a great novel about Nigeria and this boy Elvis growing up— it takes place in the early 1980s, but flashes back to earlier in his childhood growing up. Kinna, I’ve posted the link to the second book of the Challenge, Distant View of a Minaret. It’s also here: http://readinpleasure.wordpress.com/2012/05/06/review-distant-view-of-a-minaret/. I have added a review on Desert by JMG Clezio. Come to think of it there are a few books on Africa I wanted to read this year. I haven’t sign up for the challenge but consider that I’m participating! Thanks for hosting. I just posted my review of Abina and the Imprtant Men. It is a graphic novel published by Oxford University Press about a slave girl in the gold coast who went to court to try and get freed. An interesting and unique approach. No 2: No Longer at Ease by Chinua Achebe (Nigeria). A wonderful book that works beautifully on many levels. Kinna, thank you for hosting this challenge! I have posted two impressive books by Leila Ahmed on my blog. Women and Gender in Islam is a careful academic study. Border Passage is her autobiography. I recommend them both. … and ‘The Yacoubian Building’ by Alaa al Aswany. Hi Kinna, Just added ‘The Anatomy of a Disappearance’ by Hisham Matar to the list. Just posted Women of Algiers in Their Apartment, by Assia Djebar, an exquisite collage of women’s stories from the Algerian civil war and its aftermath. Just added The Bride Price, by Bucci Emechtta, a lyrical story of young Nigerian women caught in the demands of her family and of her Ibo culture. Added review of As the Crow Flies to the list. I just posted my review of Map of Love on my blog. It is by an Eyptian woman and about Egypt, in the early 20th century and in the 1990s. I thought it was a great book. I am getting excited about reading about Africa. I’d recommend Map of Love too – and this reminds me that I have another one by Ahdaf Soueif somewhere in MtTBR. It’s called The Eye of the Sun, and I can add that to my Africa Reading Challenge booklist!. I read The Eye of the Sun and really enjoyed it a few years ago Lisa, I hope you do as well! So that’s one from Southern Africa, next – somewhere different!